Hi, I am interested in your 1966 Lincoln Continental (stock #4688-ATL) listed on Autotrader for $58,995. I'd like to get more information about this vehicle and confirm its availability. Looking to make an impact behind the wheel of a truly singular ride? 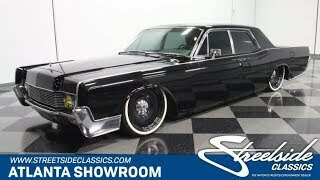 This 1966 Lincoln Continental Restomod has you covered and then some! A merger of careful planning and skilled workmanship have transformed it into an absolute attention magnet that also happens to be equipped with a great array of well-chosen aftermarket components to bring its drivability to a whole new level. By the time this 66 came out, the coveted Lincoln Continental had been returned to its traditional, lengthy splendor, growing a full five inches over just the previous year via an all-new body. When you look at this classic from the side, youll immediately notice the amount of space separating the front and rear wheels, amplified by its distinctively low stance. The customization thats been applied here is equal parts creative and tasteful - this car looks like no other in the best possible way and yet still retains plenty of its original identity, which is a tough balance to strike. The black paint draped over the exterior was only recently applied and the job was done very well - its got a consistently smooth, slick finish and a nice shine that follows you as you circle the car. Both the front and rear bumpers as well as the door handles and trim were re-chromed, tinted glass surrounds the cabin and every exterior fitting was recently polished, so the curb appeal of this 66 is at its absolute zenith. The black interior has been kept largely in its original configuration and, while you can see signs of wear inside, both the front and rear bench seats still offer their customary sofa-like comfort and the door panels to each side are in surprisingly strong condition. Just beyond the original steering wheel, the dash area is also looking very good, with the speedometer sitting behind a very clear lens, an unblemished brushed steel accent and a very clean looking dash pad running across the top. Youll also find a genuine 8-track stereo on board at the center - about as thoroughly a 60s feature as they come. A Vintage Air climate control system has also been seamlessly installed in the dash, so you and your passengers will ride in comfort. The cavernous trunk appears to be in good order and when you look inside, youll see the air tanks indicating that theres no ordinary suspension lurking below. Plenty of modern, dependable power comes in the form of the fuel injected LS2 6 liter V8 standing by under the hood. Its good for a substantial 338 horsepower at the rear wheels and, like the 4L60E transmission sitting just behind it that offers the convenience of engine-sparing overdrive, is very fresh and has been professionally installed. The stance and ride on this Lincoln offers chameleon-like adaptability. A toggle switch positioned under the dash controls the outstanding Accuair E-level suspension, which includes 4-link systems in both front and back. Just like the drivetrain, these components were also installed by people who know what theyre doing, so everything functions just as intended. The power steering system has also been rebuilt, so the handling is smooth and precise, while the power brakes sitting just inside the set of show-stopping black Mobsteel wheels bring prompt and easy stops. Well-crafted customization over a vintage foundation combines with a strong, dependable modern drivetrain and a top tier aftermarket suspension to make this 1966 Lincoln Continental Restomod a ride like no other. Call today!